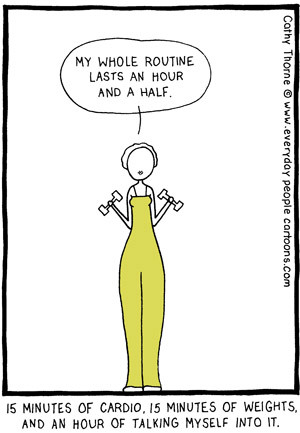 I feel like this is one of the age-old questions of working out: cardio or weight training first? Fitness trainers have varying opinions and preferences but from what I’ve read and personal experience, it depends on how you feel and what your goals are. When I do my cardio first (which is usually about 45 minutes), I have more than enough energy to do my weights after. But my goal isn’t massive strength gains, it is fat loss and having muscle tone. When I do my cardio after my weights, I don’t perform as well as I can; I’m slower and can’t go for as long. So while cardio before weights works for me, I do like to challenge myself once or twice a week and try cardio after weights just to push myself. However, if your goal is to gain size, then doing cardio after your weights may be a better option for you. You’ll definitely need your energy so you can lift as efficiently as possible…without getting fatigued too quickly. There aren’t very many studies out that compare the effectiveness of where cardio is placed in your workout, so when making the decision, keep in mind your ultimate goal(s) and build your routine off of that.